After reviewing the fire hazards that the NFPA outlines with your children, go for a walking tour around your house and see if they can identify any areas that need attention. In the kitchen, ask them what habits can help prevent fire from occurring while cooking. In living spaces, have them look for any potential dangers, like a candle or space heater, then ask them how those things should be positioned for proper safety. If working with a classroom, you can also review the fire hazards with your students, and ask if they can think of examples of safe practices for each category. In the workplace, you can make sure your employees are aware of these everyday fire hazards, and verify they know the proper ways to handle things like electrical equipment or the disposal of smoking materials. Another great way to review these safe practices with your children is through a scavenger hunt. Ask them to find different things around the house that pertain to fire safety, such as the hazards mentioned above, and especially the smoke detectors. Ask them to count the smoke detectors, then go through every room and review the position of the detectors, why it is important that they are located in certain places, and test the smoke detectors while your children watch and listen, so they know what it sounds like. In a school or work environment, the smoke alarms are normally tested periodically, so most students and employees have the chance to hear and practice the correct response to the alarms. If, however, your workplace does not have routine fire drills, look into scheduling one so that your employees do know what your alarms sound like. You will need to discuss this with your fire protection company, to make sure your fire alarm systems are set on “TEST” mode, so that the fire department is not called to respond during your drill. Once you have reviewed the safety measures and potential hazards in your home and tested the smoke alarms together, it is the perfect time to review your fire escape plan with your children. Sit down as a family and create one if you haven’t yet, and be sure to review this article describing the essential components of a good escape plan. Decide on a regular schedule for reviewing this plan, perhaps once every season, so that the family members remember what to do. Be sure to update the plan as the children get older or things change in your household. 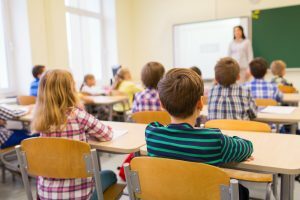 For school environments, asking a representative from your local fire department or fire protection company to come and give a safety demonstration is a wonderful way to present safety procedures to your students. They will practice the school’s escape plan during fire drills, but you could find out from the school staff if there is a copy of the escape plan you can post in your classroom if it is not already posted, that way your students have a visual reminder of what to do. At work, code required copies of the fire escape plan, with clearly marked exit routes, to be posted at regular and visible intervals in your building. It is also a good idea to review this with your employees regularly, and to consider the best way to have organized fire drills on a periodic basis, one that works for the size of your business. Though a drill like this may be harder to organize for a large company, the more employees you have, the more lives that are at stake should a fire occur, so it is very important to consider your options for educating your staff effectively. “Look. Listen. Learn.” addresses an important set of skills that can save lives when taught and reviewed well and regularly. We will share a list of other resources for learning and teaching this material tomorrow, but start thinking today about how you can implement the above tips in your home, school, or business.